appropriate following weeks of rolling blackouts that have left citizens irate and anxious. and unions, as well as activists and citizens. Mozambique and recurring drought patterns across southern Africa. burden in an economy already beset by high unemployment levels. were in favour of protecting coal jobs. of poor energy management for some time to come. 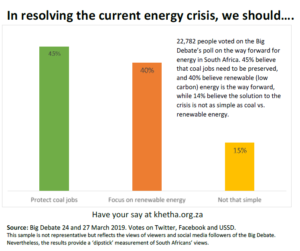 The Big Debate poll was conducted by Grassroots, Social Surveys Institute and OpenUp. Luminate, Open Society Foundation and Ford Foundation.